No matter what position you stake out on the political see-saw, and no matter how hard you try to keep your balance, you need a circus in your life these days. We all are participants in a circus of sorts, strutting and fretting our individual convictions in a public mega-multi ring circus of sounds and furies that is ever more fantastic and bizarre, a grand guignol playing out under the tent of the sky, a performance fraught with irrationality and pocked with prevarications that once would have been regarded as too silly for fiction. Yet on we go, Ladies and Gentlemen, Boys and Girls, perhaps reading Mother Julian of Norwich who promises “all will be well and all manner of thing (sic) will be well.” Or perhaps because for a few bucks we treat ourselves to the venerable theatrical tradition called circus. It generally is recognized as entertainment but operates vigorously as parable. Thursday’s Circus Flora show, playing to a full Big Top in the circus’s new home at 3401 Washington, was satisfying entertainment indeed. The new location seems to have introduced a greater sense of artistic thrift and clarity in comparison to shows from years past. It is through this comic rationality we see a community afflicted by crime trying to work its way through to an equilibrium and finally redemption, and that is the stuff of allegory and parable. Cecil MacKinnon created this versatile script, and in the show, steered artistic energy in pre-arranged (and correct) directions. She is Yo-Yo the narrator. She understands Shakespeare and circus and metaphor. Jack Marsh is artistic director, and he was in attendance in white tie and tails on Thursday, looking as if he’d walked out of a Fred Astaire-Ginger Rogers picture show into a Big Top where he’d supervise Circus Flora. For The Case of the Missing Bellhop, the action is played out at the Balding Hotel, a lodging house named in homage to Ivor David Balding, founder of Circus Flora. The hotel is grand enough to attract Detective Gordon (the audaciously talented Amy G.), who carries the show through by coming in extremely handy in a harrowing investigation, as well as some socialites and celebrities. Gordon, the rather louche detective, is determined to find the Bellhop, and the Evil Wrongdoer, who kidnapped him. The bellhop is played by the outrageously, enormously talented Adam Kuchler, who steals the show with acts of dexterousness along with enough charisma to share sparkle with every member of the audience. Unless I am wrong or too smitten with this 32-year-old St. Louis Institution, talent and charisma and moxie are all parts of the magic puzzle that is Circus Flora, Stars such as Kuchler and Amy G. make all of us feel that they simply adore all of us and that when they look out into the audience or venture forth into it, they are looking out for individual fans to involve in the show. Another very good reason for rolling out the genuinely large and echoing cheers is for Circus Harmonie’s St. Louis Arches. This company of young acrobats are trained by the inimitable Jessica Hentoff, who has created an acrobatic curriculum in her school. While training youngsters 12 to 22 years of age in the joys and physically challenging art of the acrobatic, Hentoff propounds a social mission: the employment of justice and understanding and diversity as a means to peace. It is never preachy, just evident in the beaming faces of the children who have worked together to create physical and visual miracles. There is plenty to be said for traditional circus acts also. I mean, no one who has been in the audience for Flora ’18 will not remember Cuzin Grumpy and his Pork Chop review, which features two enormous trained pigs, plus two wee pigs, and all of them do tricks generally associated a dog act, including singing. There are the Flying Wallendas, whose gift of balance is extreme but welcome when these talented troupers, under the direction of patriarch Tino Wallenda, and perform one of their well-known but always breathtaking pyramids on the high wire. Jayson Dominuez’s act may have borrowed some of the oooohs and aaaaahs from the Wallendas in his debut appearances with Circus Flora. This athlete performs on a huge contraption that has evolved from the arms of cranes and the exercise wheels of gerbils and white rats. Not to diminish Domínguez in any way, but to give you an idea of what transpires, think of Jayson as gerbil. This machine It is being called “The Wheel of Destiny” by our family-friendly hometown circus. Its real name, however, is “The Wheel of Death”. Trapeze and rope artist Rachel Karabenick not only performed beautifully but also served as the villain who kidnapped the busboy and famed circus historian, performer and philosopher Hovey Burgess, who appears as the chef for her. Her identity was made known by a member of the audience. Canine and equine visitors are accommodated at the Balding establishment. There is a tribe of basset hounds that arrived with the detective, and Lancelot, Fez, Hershey and Frosty, massive horses associated ridden by the Alanian troupe of horse-riding entertainers whose history dates back more than a hundred years. Riders led by Lev Gigolaev perform galloping thrills and a sense of the wild in a one-ring circus. Thus in its variety and celebration of difference, we are reminded, through the art of the circus, how our desires for justice, our impatience with corruption, our employment of gun-free disputes settling all work together for a happy ending, or at least a satisfactory one. If you don’t buy that, OK. 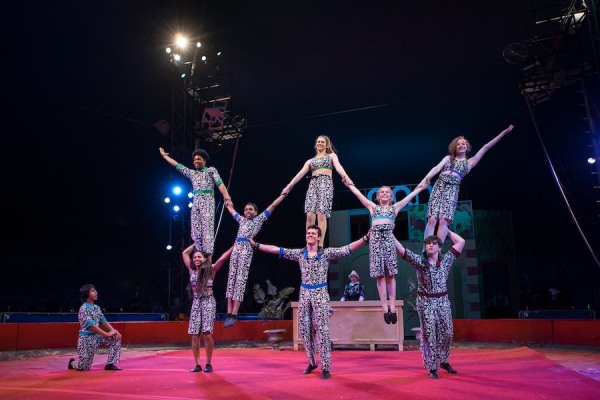 But after an evening in a circus of joy and understanding, our exasperation with the national circus, playing in a ratty tent overdue for replacement, may be easier. Easier, that is, but poised to grab the trapeze and make a flying leap for change. The Case of the Missing Bellhop runs through May 13. For performance times and ticket information, visit circusflora.org. Read the Article on St. Louis Magazine.